I’m a big believer in keeping track of things. It’s a form of self-defense. I think people with excellent imaginations need physical records to rein in their emotional responses to perceptions on a regular basis, providing a reality check, as it were. Where things like one’s own athletic performance and body composition/shape/size are concerned, it is awfully hard sometimes to be impartial. Your evaluation of yourself can be influenced by things like lack of sleep, low blood sugar, relationship woes and simply what time of the month it is. Having a notebook or file of what you have actually done, in little numbers and words, is a weapon against self-incrimination and an excellent tool to see what precisely works (or doesn’t) for your individual person. 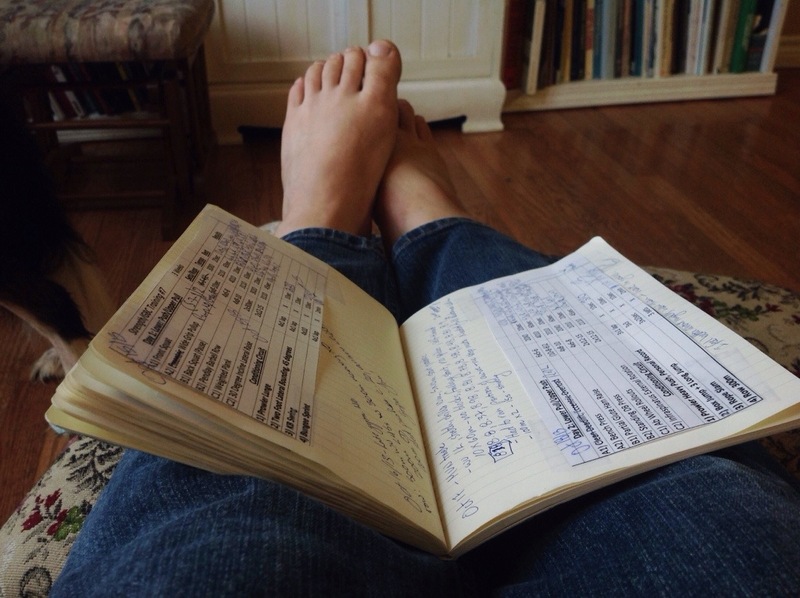 When I run, I often have a GPS unit along with me, saving me jotting down intervals or times. This uploads directly onto a computer and is maintained therein. My intervals are on a separate watch, which is just plain easier to hit the lap button on. My food is tallied in my phone on the myfitnesspal app. My strength training logs are kept partially in my file at the gym and partially on a spreadsheet on my phone (for the workouts I do on my own). It was a fine system at first, but not one that enabled me to see quickly how things fit together. So last week I took a little time and started piecing together the strength training, intervals and other running/cross-training workouts, along with any other notes that might be relevant, into an actual physical log. I used to keep one in past years and it was essential in planning future programming. It’s good to have one again now. I can actually see quite quickly a few things that need tweaking diet-wise, for instance, and have a much clearer picture of why I tanked on certain workouts (for things like insufficiently balancing heavy and light days or timing my food intake poorly). It also shows me how far I’ve come in five and a half months, which makes me feel even more optimistic about where I’m going and how to get there.